Out of all the Doodle dogs, the mini Bernedoodle might be the one with the craziest and most shocking parents in terms of height and weight. One look at its fluffy coat is enough to make you fall in love, but don’t get tricked into buying a cute dog before reading all the necessary information. This breed is full of surprises. 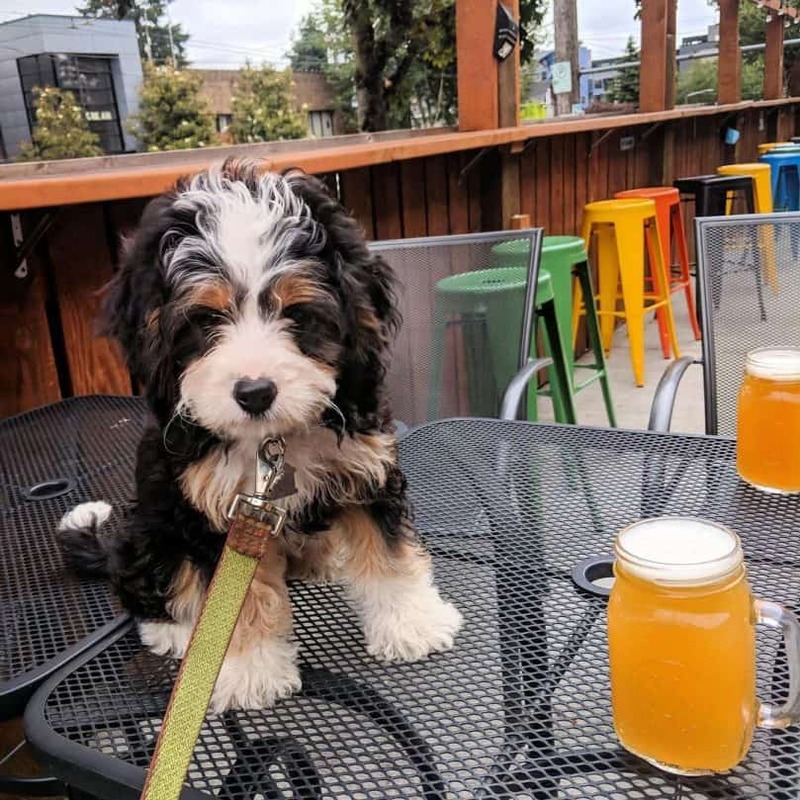 I was excited to write this article because the mini Bernedoodle is such an unexpected mix of two dogs who, on paper, shouldn’t have gotten together. But hey, it happened! Fact is always stranger than fiction. What Can We Predict About The Mini Bernedoodle? This dog is one of the parents breeds behind the mini Bernedoodle. This is where the “mini” part comes into play. Anything I say about the mini Poodle could surface in its offspring, including personality traits, size description, and overall care. Just something to keep in mind. This so-called “frou-frou” dog with French/German ancestry reaches between 11 – 14 inches (28 – 35.5 cm) at the withers and weighs between 6 – 9 pounds (3 – 4 kg). Poodles of all sizes (standard, toy, and mini) are intelligent, alert, and responsive to their surroundings. Their wits make them easy-to-train dogs who are eager to please and follow commands. 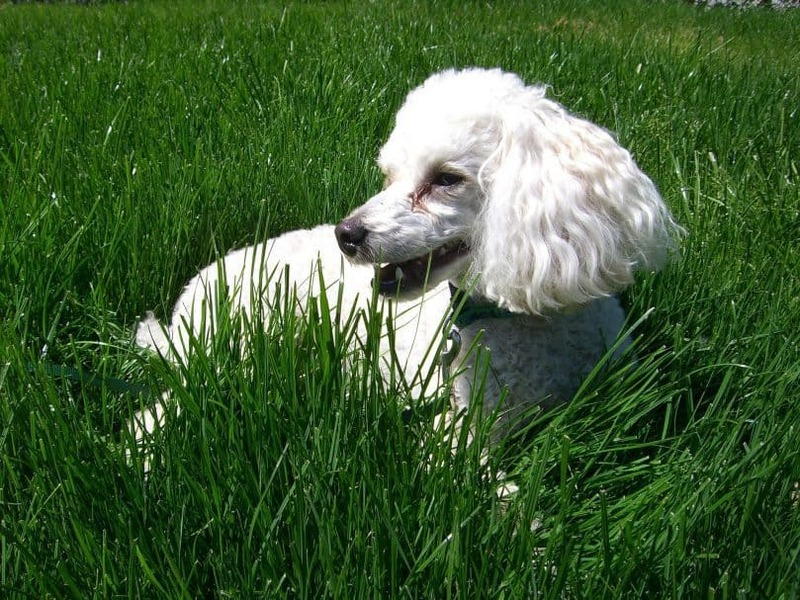 The most common health issues for Poodles are bloat, hip dysplasia, collapsed lungs, and epilepsy. I grew up on a Poodle, and she never experienced any serious health concerns. Poodles are generally healthy pups. 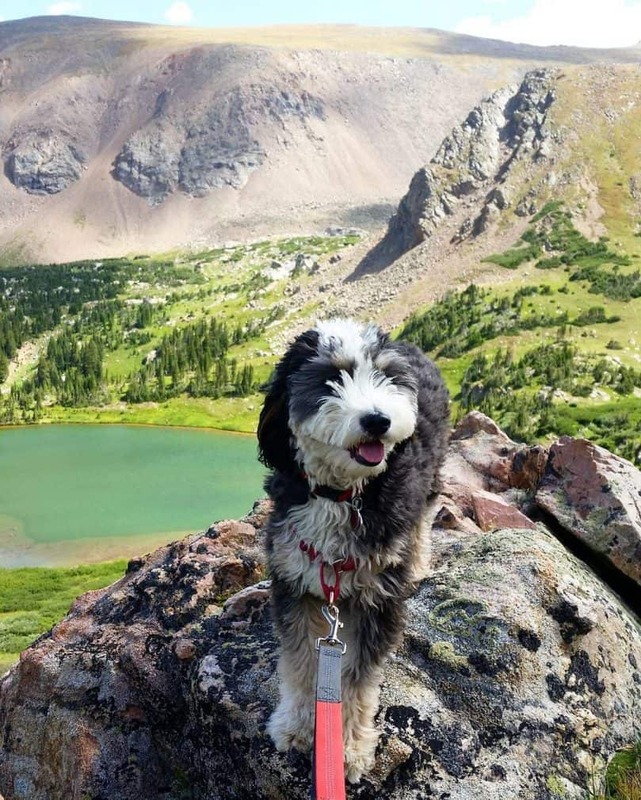 This outdoorsy fellow is the mini Bernedoodle’s second parent. This is where the word “mini” flies out the window. If you’ve ever seen a Bernese Mountain Dog, they’re huge and insanely fluffy and cuddly. You cannot overlook their signature black, brown, and white coloring, which makes them easy to spot out in the wilderness. This purebred weighs between 79 – 110 lbs (36 – 48 kg) and reaches a top height of 28 inches (70 cm). It’s hard to imagine how this big of a dog mated with a mini Poodle, right? The temperament of a Bernese Mountain Dog is affectionate, intelligent (same as the Poodle), and loyal. The primary health concerns to look for are hip dysplasia, elbow dysplasia, and mast cell tumor. Sadly, these larger breeds tend to live shorter lives. It has a lifespan of 6 – 9 years on average, while the mini Poodle can live up to 15 years. OK, now that you’ve been officially introduced to the mini Bernedoodle’s parents, now we can see what happens when these two make cute puppies. No one really knows for sure when the first mini Bernedoodle came to be. But in 2003, in Ontario, Canada, Sherry Rupke became the first person to intentionally breed two Bernedoodles from her kennel. Sherry later began breeding miniature Bernedoodles. One quick thing to mention is that this dog is not registered with the American or Canadian kennel clubs. To make accurate predictions, you’d most likely have to meet the parent breeds in-person to see how they behave and what they look like. Any assumptions made about the miniature Bernedoodle will stem from the characteristics of a mini Poodle and Bernese Mountain Dog. That includes everything from height, weight, coat colors, and personality. 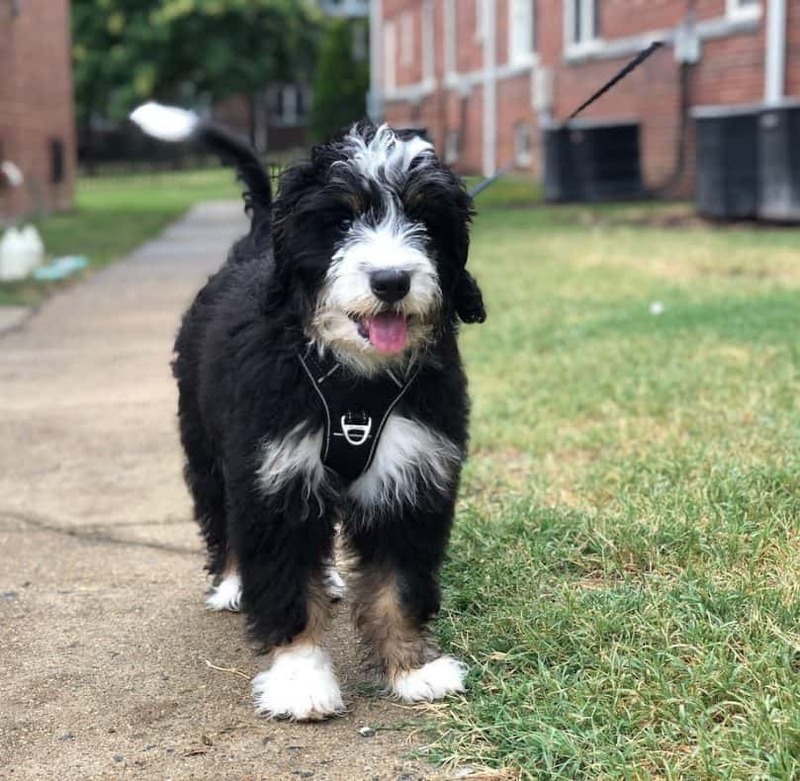 Based on what we’ve read before, it’s likely that a mini Bernedoodle will take on the intelligence of both its parents, as well as the health concern of hip dysplasia. This mixed breed comes in many shapes and sizes since it’s impossible to determine what percent comes from a Poodle and what from a Mountain Dog — unless you take a DNA test. Here’s the bottom line: if you’re picky about the type of dog you want, choose a different dog. A purebred one. If you’re falling hard for the mini Bernedoodle, you’ll be pleased to know that it has a life expectancy of 17 – 18 years. That’s about as long as the average Chihuahua, which is considered one of the healthiest dogs in the world. Confused by the overwhelming number of Doodle mixes out there? Yeah, me too. There are so many that it’s hard to keep track. Just look at all these crosses! The list goes on — and there are even MINI versions of some! 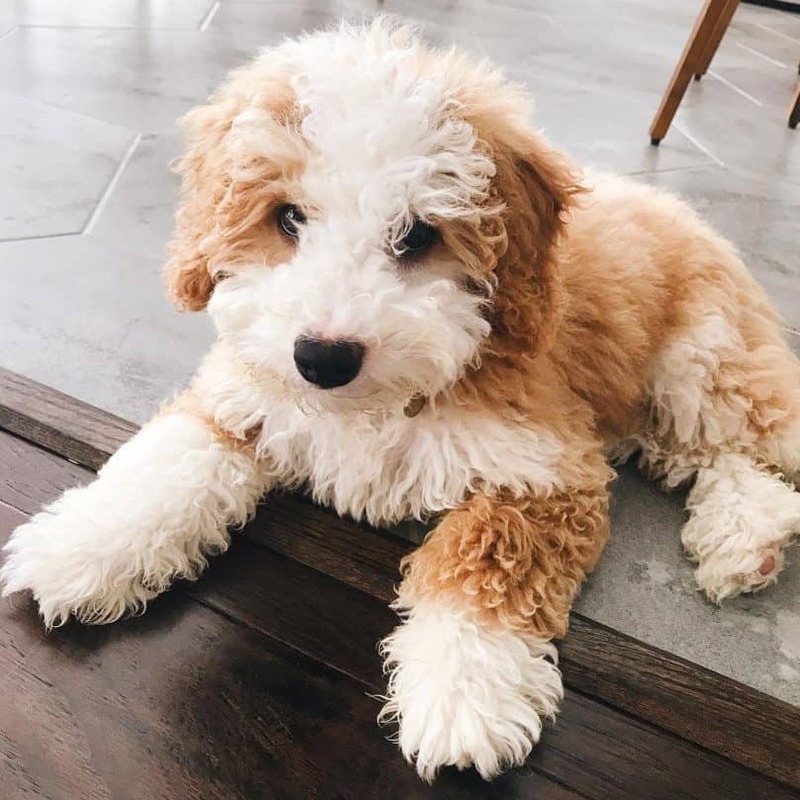 It seems many people confuse the mini Bernedoodle for one of these Poodle mixes. And so, here’s a little size comparison between them. See, mini doesn’t always mean pocket-size. In terms of personality, the miniature Bernedoodle is considered more loyal and active than the mini Goldendoodle. The mini Bernedoodle can also be more stubborn and headstrong, so you need to be patient, firm, and consistent during training. This trait comes from the Bernese side. 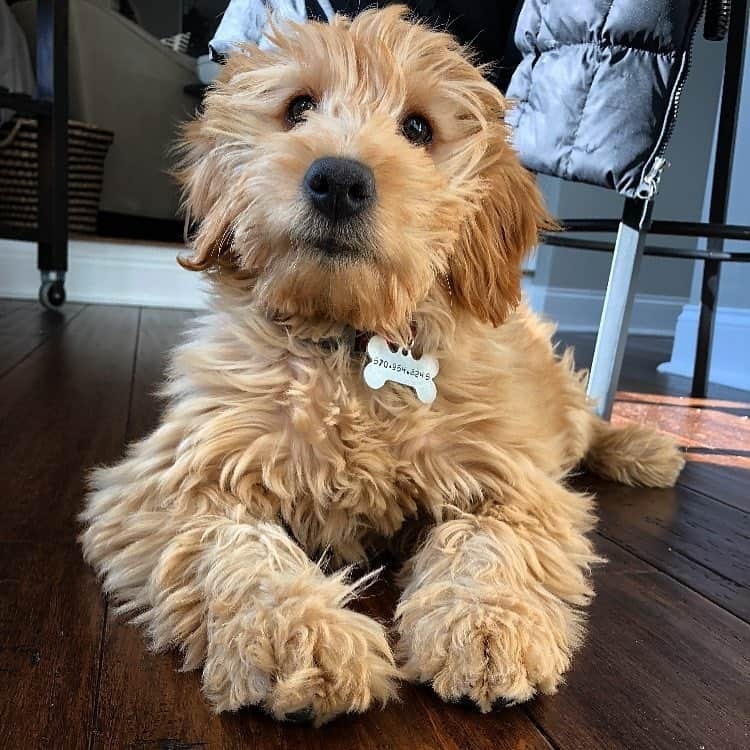 Mini Goldendoodle’s have a lighter coat and do slightly better in hot and humid climates. The Mountain Dog prefers the cold, unsurprisingly, based on its name. In the grand scheme of things, these are minuscule differences. These two Doodle dogs are very similar. Does size really matter? In this case, the answer is most definitely. A full-grown standard Bernedoodle is 23 – 29 inches (58 – 79 cm) at the shoulder and weighs between 50 – 90 lbs (22 – 40 kg). Smaller Bernedoodles (like the tiny and mini) will have a slightly more energetic vibe, which is a direct reflection of the mini Poodle personality. One of the biggest perks of a mini is you can take it almost anywhere. It can sit on your lap or fit in a smaller crate that you might take on the plane. It would be hard to keep a standard Bernedoodle in an apartment. Mini Bernedoodles are suitable for small homes and also cost less than standard ones in the long run. They eat less, have fewer vet visits, and don’t require a large doggie bed. So far, we’ve discussed the many differences between a mini Poodle and a Bernese Mountain Dog. Surprisingly, they do have one big thing in common — their temperament. 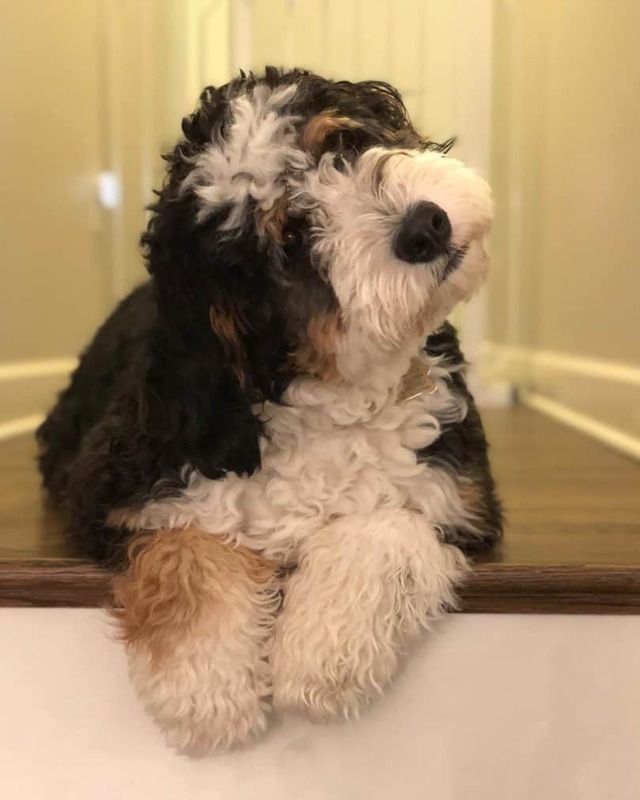 The personality traits passed onto a mini Bernedoodle are friendly, smart, and major people pleasures, which could indicate that puppies are easy to train. This breed is sweet and gentle around people of all ages but does slightly better in homes with older children who know how to behave around a dog and properly care for it. The mini Bernedoodle is rarely aggressive but can be shy at first around strangers. So, how does one properly care for such an unexpected breed? Proper training has a lot to do with raising a friendly dog. The mini Bernedoodle requires early training and socialization to ease up around strangers. As for exercise and outdoor activities, this breed can do it all! It enjoys easy-going walks, challenging hikes, and loves swimming. Contrary to their admiration for the great outdoors, the mini Bernedoodle is capable of being low-key and relaxed around the house. It only needs 30 minutes of exercise each day but prefers more. Dog parks are also a great option for this mix because it’s insanely social. If you live with other dogs, this is an excellent choice for you. Boredom is a mini Bernedoodle’s number one enemy. Even when kept indoors, give your dog a chew toy or something to hold its attention. Otherwise, it might destroy the house, tear up your clothes, or break dishes in the kitchen. Regardless of how much your mini Bernedoodle sheds, it’s important to take care of its coat. And teeth. And ears. And eyes. For grooming, its coat needs to be brushed on a daily basis to avoid matting and tangling. It may need a haircut every 8 – 12 weeks depending on the climate and temperature. Most owners prefer to leave their mix with a fuller coat. Maybe because it looks cuter that way, but totally up to you. For the amount of time you’ll spend brushing this dog, you’ll make up for it in bath time. Mini Bernedoodles should not often be bathed as it strips their coat of natural, healthy oils. Surprise, surprise. Even the cost of a mini Bernedoodle is unpredictable. Pricing depends on region, health, and coloring. Tri-colored mixes (black, white, and brown coats), are high in demand, and therefore, will be the most expensive choice. Solid colored or two-toned mini Bernedoodles are slightly cheaper, but it’s nearly impossible to find this dog under $1000. You can see them in all black, white and brown, and white and black. If you were to purchase a miniature Bernedoodle from a legitimate breeder, it could cost up to $4000. This is one of the most expensive puppies I have ever researched. In the end, only you can decide if paying $4000 for a dog is worth it. I’ve seen many people look for cheaper options, but it’s cruel to go through a puppy mill, and most illegitimate breeders have no idea what they’re doing. 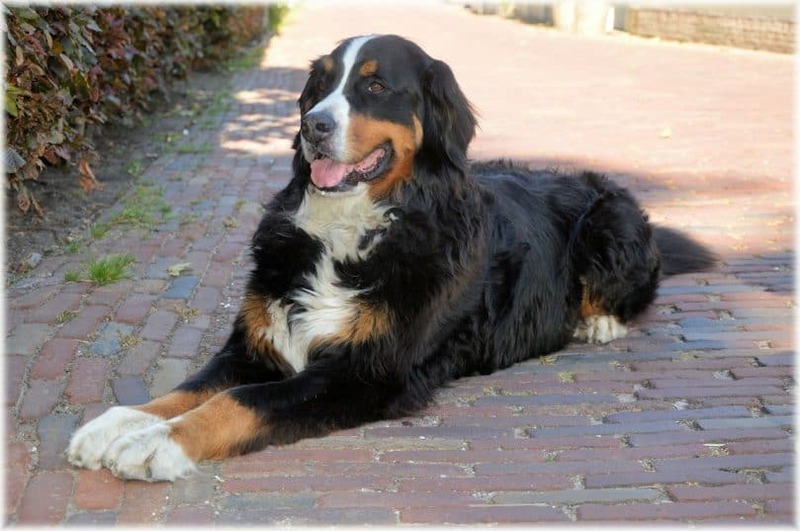 These are the top breeder sites I’ve come across: Alpine Bernedoodles based in Colorado, HC Bernedoodles in Missouri, and Sherry’s official breeding website called SwissRidge Bernedoodles. You read about her earlier and she’s based in Ontario, Canada. Feel free to check out adoption and rescue sites as well, but a dog this expensive likely won’t be found on those platforms. If you are incredibly passionate about the #adoptdontshop movement, consider rescuing a different Poodle or Bernese Mountain Dog mix from a shelter. This counts for all dogs, not just mini Bernedoodles. But since this particular mix is so uncertain, it’s vital for a breeder to allow you to meet the parents first. A top breeder will also work with you after you take the dog home to see how it’s adjusting to a new setting with new people. Always take down the phone number and email of your breeder. If a website or company doesn’t offer one or all of the bullet points above, something sketchy is going on, and you need to leave. If you’ve been doing a lot of research on this dog, chances are you’ve come across the F1 and F2 letters. But what do they mean exactly? 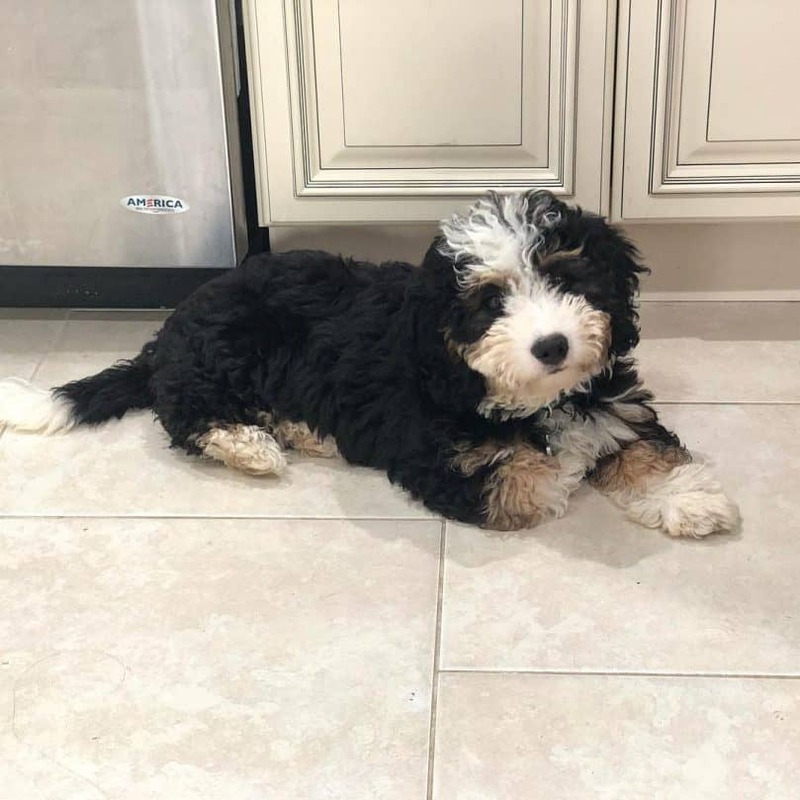 What is a second generation mini Bernedoodle? Allow me to clear that up for you. F1 is a first generation cross, which means a puppy is a half mini Poodle and half Bernese. 50% both ways. F1b is a backcross in which a Bernedoodle is bred with a Poodle (size doesn’t matter here). F2 is a second-generation cross, in which an F1 mini Bernedoodle is crossed with another F1 Bernedoodle. I know, it gets confusing after awhile. The F2 stage goes on for seven generations until the dog can be registered as a purebred. To learn more about Bernedoodles, watch this introductory video below. The mini Bernedoodle is an affectionate companion who can adapt to many lifestyles. This dog loves physical activity but can chill for hours at home with some toys nearby. It’s friendly to everyone and has an eager-to-please attitude. 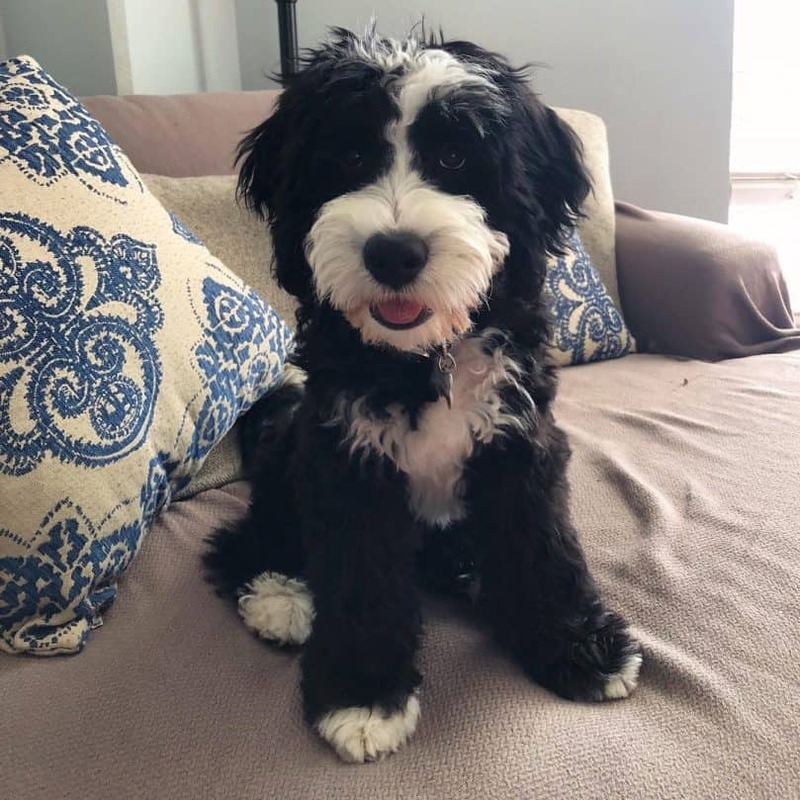 With so much unpredictability, the mini Bernedoodle does best with an easy-going owner who loves surprises and is willing to adjust their way of living for a dog. And has the money to pay for it. $4000 is no joke. Do you think you’re the right fit for this mix? Comment below and let us know!